In our every day lives, we are all guilty of neglecting our minds, allowing our brains to be lulled into a lazy, neglected, and unaware state. It is as if we are allowing ourselves to be sculpted by bland and repetitive consumerism, our individuality being chiseled away by tedium we cannot even be bothered to challenge with any will. Life need not be like that. We are each blessed with a powerful mind; but normally people have forgotten or, most likely, never even knew how to use it. It is such a waste of our own greatest resource. One way to start to extricate ourselves from the mindless quicksand is to gently exercise our minds, using mindfulness and meditation as a way of bringing ourselves more emphatically into the real world, and start the process of exercising control over our minds and our lives. Mindfulness practices can help us to increase our ability to regulate emotions, decrease stress, anxiety, and depression. It can also help us to focus our attention, as well as to observe our thoughts and feelings without judgment. Jon Kabat-Zinn, the leading mindfulness researcher in the field of psychology, and developer of the Mindfulness-Based Stress Reduction program, further clarifies that engaging in mindfulness is a secular practice and not a form of religion. It’s true that mindfulness is often used to complement religious practices by quieting one’s mind before prayer or meditation. But while meditation can be a method of practicing mindfulness, mindfulness can also be practiced in non-religious ways. What Exactly Is Mindfulness? Exploring Mindfulness And Meditation By Embracing The Present Moment. Essentially, mindfulness is a form of meditation that has been adopted by CBT. CBT, in turn, is ‘cognitive behavioral therapy’; a psychotherapeutic approach that can be used to treat all manner of psychological conditions like anxiety, phobias, addiction etc. Mindfulness essentially gives us a tool that we can use to not only calm our thoughts and escape the stressors of the day but also reflect on the contents of our mind in the interests of self-improvement. Meditation generally has something of a ‘bad’ reputation. That is to say that a lot of people associate it with religion or esoteric ideas and they think that they can’t meditate unless they’re‘spiritual’. This can be off-putting for someone who doesn’t hold any religious beliefs or who don’t like esoteric ideas in general. But in fact, you can practice meditation whether you are religious or an atheist. All meditation really is, is a directed attempt to control your thoughts and the content of your mind and thereby to gain some peace and quiet or at least to be able to better understand the contents of your own brain. Often this means completely silencing all thoughts. Many types of meditation, such as transcendental meditation, instruct you to think of ‘absolutely nothing’ and often this is achieved by focussing on your breathing, a mantra or a physical object like a candle flame. This can be difficult for beginners though, as they constantly find their mind wandering. The idea behind mindfulness meditation then is not to try and empty your thoughts but instead to simply step back from them and ‘observe’ them like a detached third party. This way, you aren’t letting your thoughts affect you and make you stressed but you also aren’t going to struggle with not being ‘allowed’ to think anything. Meanwhile, using this technique will also allow you to become more aware of your own thoughts and thereby able to edit any thoughts that are leading you into trouble. For instance, if you constantly find yourself thinking about the ways that you could hurt yourself, you might notice that this is a bad habit and then attempt to fix that. This may be the long term aim of mindfulness when used in CBT. In the short term though, we are simply to use it in order to remove ourselves from our thoughts and emotions so that we can get some calm and thereby recover ready to tackle the day ahead. This is what mindfulness refers to in most cases but it has also been appropriated to mean a lot more. If mindfulness means being more aware of your thoughts, then it can also be applied outside of meditation and to the way you go about your day. In this case, mindfulness simply means being mindful of what you’re focussing on and what you’re thinking at any given point. This is useful because very often you’ll find that your mind isn’t perhaps where it should be. For example, if you are walking through a beautiful scenic woodland but you are thinking about work, then as far as your body is concerned you may as well be at work. In this case, mindfulness can be used simply to make yourself more aware of where you are and to actually focus on what’s around you. That means feeling the breeze on your skin, looking at the beautiful flowers and smelling the fresh air. When you do all that, you will benefit much more from the experience. Likewise, you can use mindfulness to direct your attention to all manner of other things. For example your physical sensations. Often we aren’t aware of just how we’re sitting, how we’re standing or how we’re feeling. Take a moment right now to reflect on this. How comfortable are you at the moment? Does any part of your body hurt? If you’re sitting down, then where is most pressure on you? Can you feel your clothes against your body? A watch maybe? How warm are you? Are you leaning more to one side? This kind of mindfulness can be useful if you want to try and fix your posture but also if you want to improve your abilities in sports or just move more efficiently. Being more mindful of the way you speak can meanwhile help you to speak more eloquently, to stop using derogatory words, to stop swearing, or to change the whole way that people perceive you. For example, if you want to sound more intelligent, then you can simply try using bigger words or speaking a little more slowly. You can also use mindfulness to be happier in everyday life. Simply try to stop letting negative emotions affect you by identifying them as temporary and destructive. You can simply ‘notice’ that you’re getting angry and acknowledge that your thoughts will be tainted by that. With practice, this can make you a much calmer and much happier person. But what do you find when you try and do this? In all likelihood, you’ll find that you forget. This is just the same way that you forget to pick up bread when your other half asks you to. And it’s just the same way you forget to pick up your keys on the way out of the house. The point is most of the time we have no control over what we’re focussed on or what we’re paying attention to. And as such, we find ourselves forgetting things, getting into bad habits or stressing when we should be enjoying ourselves. Practicing mindfulness both as a form of meditation and during the day can, therefore, help you to improve your ability to control your thoughts and thereby to decide how you want to improve yourself and what you want to focus on. Creating a mindfulness meditation is a gentle but powerful exercise. But how do you go about it? As with any meditation session, you need to get into a relaxed and comfortable position, eyes closed, and then commence with deep nasal breathing, focusing your thoughts on the breathing to ease yourself into a meditative state. Once you feel that you are calmed by your breathing and that your breath is under your rhythmic control, then you can move on to focusing on your own body, a part at a time. I was first taught this at yoga class, where we were taught to concentrate first of all on the left foot, focusing on it from a position above ourselves. Then move up the body slowly, left ankle, knee, thigh and so on. When reaching your head, you then do the same in reverse on the other side of the body: right shoulder, right elbow, right hand and so on. Once you have completed the tour of your own body, as if you were someone else examining it, then it is time to open your eyes and increase the mindfulness of your surroundings. To do this, focus on any object in the room; it does not have to be anything special: a cup on the coffee table, a vase, a plastic flower, anything. Try to maintain that focus for half a minute, and then move on to any other object. You can repeat this several times, always maintaining a focus on your own body and your own breathing, creating a triple harmony with each object on which you focus. By using this simple mindfulness meditation you are increasing awareness both of yourself and your surroundings, in a very gentle and easy way. It can serve as a prelude to some mental task, as well as being part of an ongoing mindfulness campaign to strengthen and expand the use of your own mind. For example, most days I write, but sometimes I just do not seem able to concentrate on what I am supposed to be writing about. I find this type of exercise, even just for 10 minutes, will snap me out of that inexplicable malaise, and I can get right to it and write what I should have written earlier. I have found in meditation teachings that the body scan meditation is often overlooked or ignored as a method of deep relaxation. So, here’s some information on how this process can assist you in your practice. What is a body scan meditation? A Mindfulness body scan meditation is one type of mindfulness meditation which promotes greater awareness of the physical body. It uses the physical sensations of the body and visualization as an anchor to fix the mind in the physical body and more importantly, in the present moment. You should not be overly concerned with these aspects of a body scan. However, the body scan meditation is primarily a relaxing practice, although other more uncomfortable sensations, such as tingling, burning or numbness may also arise. Body scan meditation has been researched very well and found to be effective for improving well-being, decreasing physical discomfort and pain, and reducing stress levels. Anything in life that you put your focus on will be amplified to some degree, so just be aware that any discomfort, in the beginning, will ultimately benefit your meditation practice. Bringing mindfulness to the body before you meditate, can help you learn and understand what your body may and may not need in order to perform at peak performance. As odd as it may sound, body scanning can also reveal a great deal about your outer world and your inner life. As you learn and begin to experience the effects of practicing the body scan, you can start to understand how stress and anxiety affect you at a deeper level. You will discover more and more how you can live a better life even with everyday physical pain and illness. By bringing awareness and acknowledgment to whatever you feel or sense in the body, the body scan can be very helpful in working with stress, anxiety, and physical pain. While you may have heard about meditations that create out-of-body experiences, the object of the body scan is to have an “in-the-body” experience. In the body scan, you methodically bring attention to the body, beginning with the left foot and ending at the top of the head. Since the body is a dynamic organism that’s always changing, no two body scan meditations will ever be completely alike in it’s physical and mental dimensions as each session is unique to itself. This is part of the meditation journey you will be on hopefully for the rest of your life. As you continue to practice, you’ll discover what Martha Graham sagely noted: “The body says what words cannot” . When you practice the body scan, first simply become aware of physical sensations by exploring their felt sense. This is distinct from thinking about your body. There’s no need to analyze or manipulate your body in any way; just feel and acknowledge whatever sensations are present. Throughout this deep investigation, your body may begin to reveal a whole range of feelings. In this way, the body scan can bring you in touch with many aspects of your life, both physical and mental. Here’s a very good body scan meditation script in addition to the mp3 file above that you could record in your own voice and create a very effective meditation session for yourself. Yes, the awareness of your own voice however good or bad is a revealing mindfulness exercise in itself. Begin by making yourself comfortable. Sit in a chair and allow your back to be straight, but not stiff, with your feet on the ground. You could also do this practice standing or if you prefer, you can lie down and have your head supported. Your hands could be resting gently in your lap or at your side. Allow your eyes to close, or to remain open with a soft gaze. Take several long, slow, deep breaths. Breathing in fully and exhaling slowly. Breathe in through your nose and out through your nose or mouth. Feel your stomach expand on an inhale and relax and let go as you exhale. Begin to let go of noises around you. Begin to shift your attention from outside to inside yourself. If you are distracted by sounds in the room, simply notice this and bring your focus back to your breathing. Now slowly bring your attention down to your feet. Begin observing sensations in your feet. You might want to wiggle your toes a little, feeling your toes against your socks or shoes. Just notice, without judgment. You might imagine sending your breath down to your feet as if the breath is traveling through the nose to the lungs and through the abdomen all the way down to your feet. And then back up again out through your nose and lungs. Perhaps you don’t feel anything at all. That is fine, too. Just allow yourself to feel the sensation of not feeling anything. When you are ready, allow your feet to dissolve in your mind’s eye and move your attention up to your ankles, calves, knees, and thighs. Observe the sensations you are experiencing throughout your legs. Breathe into and breathe out of the legs. If your mind begins to wander during this exercise, gently notice this without judgment and bring your mind back to noticing the sensations in your legs. If you notice any discomfort, pain or stiffness, don’t judge this. Just simply notice it. Observe how all sensations rise and fall, shift and change moment to moment. Notice how no sensation is permanent. Just observe and allow the sensations to be in the moment, just as they are. Breathe into and out from the legs. Then on the next out-breath, allow the legs to dissolve in your mind. And move to the sensations in your lower back and pelvis. Softening and releasing as you breathe in and out. Slowly move your attention up to your mid back and upper back. Become curious about the sensations here. You may become aware of sensations in the muscle, temperature or points of contact with furniture or the bed. With each out-breath, you may let go of tension you are carrying. And then very gently shift your focus to your stomach and all the internal organs here. Perhaps you notice the feeling of clothing, the process of digestion or the belly rising or falling with each breath. If you notice opinions arising about these areas, gently let these go and return to noticing sensations. As you continue to breathe, bring your awareness to the chest and heart region and just notice your heartbeat. Observe how the chest rises during the inhale and how the chest falls during the exhale. Let go of any judgments that may arise. On the next out-breath, shift the focus to your hands and fingertips. See if you can channel your breathing into and out of this area as if you are breathing into and out from your hands. If your mind wanders, gently bring it back to the sensations in your hands. And then, on the next out-breath, shift the focus and bring your awareness up into your arms. Observe the sensations or lack of sensations that may be occurring there. You might notice some difference between the left arm and the right arm – no need to judge this. As you exhale, you may experience the arm soften and release tensions. Continue to breathe and shift focus to the neck, shoulder and throat region. This is an area where we often have tension. Be with the sensations here. It could be tightness, rigidity or holding. You may notice the shoulders moving along with the breath. Let go of any thoughts or stories you are telling about this area. As you breathe, you may feel tension rolling off your shoulders. On the next out-breath, shift your focus and direct your attention to the scalp, head, and face. Observe all of the sensations occurring there. Notice the movement of the air as you breathe into or out of the nostrils or mouth. As you exhale, you might notice the softening of any tension you may be holding. And now, let your attention to expand out to include the entire body as a whole. Bring into your awareness the top of your head down to the bottom of your toes. Feel the gentle rhythm of the breath as it moves through the body. As you come to the end of this practice, take a full, deep breath, taking in all the energy of this practice. Exhale fully. And when you are ready, open your eyes and return your attention to the present moment. As you become fully alert and awake, consider setting the intention that this practice of building awareness will benefit everyone you come in contact with today. Although, it would be misleading to say that the mindful body scan practice is simply about relaxation and sleep. Rather, the goal is to be aware of the different regions of your body, and allow yourself to experience how each part feels, without trying to change anything. Just being with what is there. What is the purpose of a mindfulness body scan meditation? The body scan meditation can promote body awareness, stress awareness, and relaxation. Practice it often. You can also try progressive muscle relaxation, breathing exercises, or visualization exercises for releasing stress and tension in your body. What is a body scan in mindfulness? The purpose of a body scan mindfulness exercise is simply to notice your body. It is not necessarily about relaxing your body, however, this may occur as a nice side effect. It is simply about being focused and aware of your body, in this present moment. What is the purpose of mindfulness meditation? Mindfulness as a practice is described as paying attention in a particular way: on purpose, in the present moment, and nonjudgmentally. Another way to look at this is by bringing your complete attention to the present experience of your body and/or mind on a moment-to-moment basis. “Mindfulness” is a bit of a buzz word right now, but that doesn’t mean that you should discredit it. Being mindful is one of the best things you can do for your body and mind! We don’t have studies on how marriage or long-term relationships affect life span, but you don’t have to be a scientist to take note: centurions all speak about their decade’s long marriage with a smile on their face. Having a meditation blog requires a lot of research and development of my writing skills. I found this infographic on how meditation can improve your writing skills from Wordcounter.net I thought you might enjoy. So, how can meditation improve your writing skills? Meditation can help anyone re-train their minds to perform with better focus and productivity. The biggest challenge of meditation is not the practice itself, but learning how to engage in it correctly. When creative efforts are stifled, many people grow desperate for a solution that can break them out of their funk and restore both focus and inspiration. Meditation is such a proven effective tool. Meditation calms down your inner voices and you can listen and feel the peacefulness of mind which is essential for creativity. If you practice this process, you will realize over time, your creativity will improve to a new level. Mindful writing? Isn’t that an oxymoron? Meditation is about training your mind to be focused and dedicated. So whatever you do that requires focus and dedication, meditation helps. Mindfulness aims to still your mind. When writing, you want your mind to be working in high gear. The following infographic, “How Meditation Can Improve Your Writing,” describes a short and easy mindfulness practice that anyone can commit to—and benefit from. 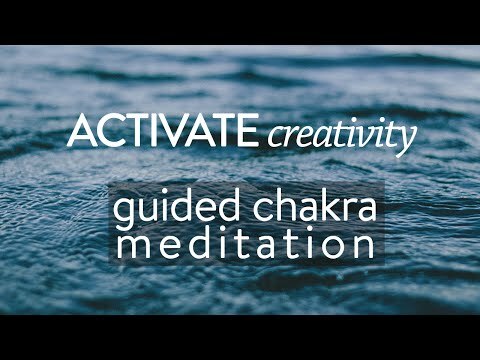 Check out this 5:00 video on how a Guided Meditation to Activate Creativity from Caren Baginski, a yoga instructor, and writer on how to use mindfulness for creativity. Activate creativity and your ability to be “in the flow” with this 5-minute guided meditation. This meditation style is useful for busy minds, allowing you to ease into deeper concentration and relaxation through visualization. Practice daily to open and energize your Sacral Chakra. Benefits include enjoying the pleasures of life without guilt, surrendering control to be “in the flow” of your creativity. How can you use meditation to increase creativity? Be playful with your meditation, show yourself compassion and kindness. Plant idea seeds in the form of an intention, but then trust the universe to work out the details. Try a guided meditation video or mp3 if you normally practice silent meditations. On the other hand, try silent meditation if you usually listen to guided meditations. Be mindful outside of your meditation time and stay connected for the answers from the universe. How does meditation relate to helping creativity? Mindfulness meditation is a great technique to learn to help improve overall creativity for more than just writing as well. It has side effects which have been shown to reduce the reactivity of the reptilian brain (something we could all use! ), increase resilience to whatever life throws our way, stimulate the brain’s neocortex function, as well as improve emotional intelligence, this also continues to be an increasingly popular skill to have in the professional world.